The Maelstrom LANDSHIP 2.0 8" Tactical Boot with Zipper is the ultimate choice for law enforcement professionals and outdoor enthusiasts. The LANDSHIP boot has an upper combination of full grain leather, breathable air mesh and suede. Behind the scenes the boot enhances the breathability with the use of perforated foam padding. To further enhance the moisture management system, antibacterial and moisture-wicking linings are applied. This combination of materials will keep your feet comfortable and dry throughout your long shift. The lightweight dynamic 3-sole cushioned system that will offer you maximum support regardless of the environment or the terrain. This cushioning system includes our specifically developed outsole, which has deep threads for great traction in all terrains. Additionally, the YKK side zipper enables quick on and off. Designed to be lightweight, comfortable and fast, the LANDSHIP 2.0 boot incorporates cutting-edge athletic design features, traditional construction processes for proven durability and a great value. They are ready to wear right out of the box with no break in time needed. It's important to routinely care for leather. To extend boot lifespan, clean boots with a damp cloth and water-based solution. This helps maintain weatherproofing and durability. Use polish and a cloth to retain the new, uniform appearance (avoid heat). LEATHER CRAFTSMANSHIP - These tactical work boots for men feature full-grain cowhide leather that offers breathable, flexible durability engineered to deliver unmatched comfort and durability with double stitching for reinforcement. SUPPORTIVE, CUSHIONED INSOLE - A high-density insole cushion makes our tactical boots more comfortable for all-day or all-night wear. In fact, the midsole is lightweight and flexible EVA to absorb shock and improve arch flexibility. HIGHLY BREATHABLE: A breathable perforated foam padding allows for superior moisture management in addition to antibacterial and moisture-wicking linings to keep your feet cool dry, and keep foot odors under control. 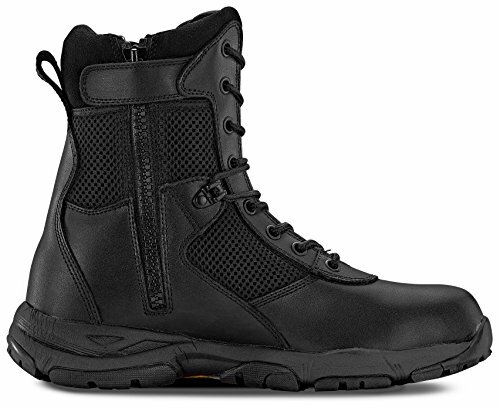 VERSATILE WORK AND LIFE SUPPORT - Commonly worn by law enforcement, security personnel, training, light industrial and logistics workers, hikers and outdoor enthusiasts these lightweight black tactical boots are made for rugged environments.